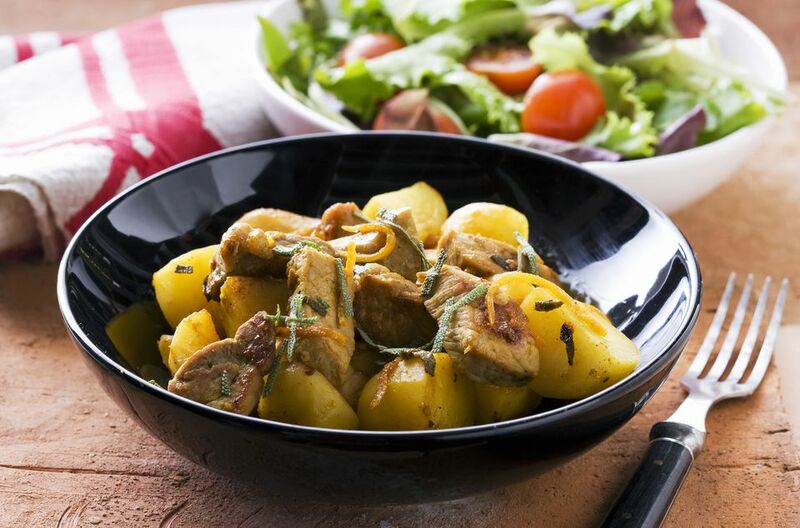 This pork stew is made with pork stew meat or cubed lean pork shoulder. The stew is seasoned with some sage, tomatillo salsa, and green chile peppers. Canned small new potatoes are added to the stew, but feel free to use baby Dutch potatoes or quartered red-skinned potatoes in the recipe. Place flour, cumin, pepper, salt, and sage in a paper bag or food storage bag. Add the pork cubes to the flour mixture and shake to coat thoroughly. Heat the vegetable oil in a large skillet over medium-high heat. Brown the pork in the hot oil in batches; remove when browned and set aside. With the pan still over the heat, add the vinegar to the skillet, scraping up brown bits (vinegar will reduce). Place the onions, chiles, potatoes, salsa, chicken broth, brown sugar, pork, and scraped bits from the skillet in a 5-quart slow cooker. Stir to blend ingredients. Cover and cook on low 8 to 12 hours, or on high 4 to 6 hours. If desired, mash a few of the potatoes to thicken the stew. Serve with freshly baked cornbread for a comforting Southern meal.